To understand identity formation native to electracy AE uses the avatar function as a relay. "Avatar" (descent) -- experienced as the reception of divine counsel (revelation) -- in the Western tradition, is dramatized as Daimon. Heidegger's method of reading the tradition was to follow the translations. Greek "Daimon" becomes Latin "Genius." In Medieval Christianity "Daimon" splits into Angel/Demon. Goethe in the Enlightenment translates "Daimon" as "Grenze," "Limit" in English. The most recent version of this experience -- the capacity of the human subject to split and encounter itself (daio) is theorized in Lacan with reference to topology, foregrounding the operation of "edge." Topology of the split subject (daio) maps the events of threshold (Catastrophe). Thresholds are the location favored by daimons. Before departing to attend his trial, Socrates paused at the threshold of his home, to consult his daimon. Boundary is on the move again in electracy, and it is the function of choragraphy to map this movement. 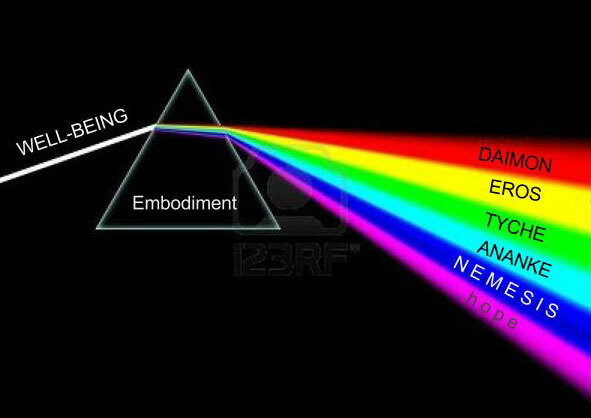 Meanwhile, the diagram showing embodiment as prism (the prism-house of being) evokes the relationship of well-being to the collection of demi-gods including Daimon. It is important to consider this set together as an inventory of Measure or Limit, as a shorthand for the forces still operating in electracy. The avatar function must include all of these forces.